Add the magic of Disney's Frozen to favor bags, party invitations, or arts and crafts projects with these adorable Disney Frozen Sticker Sheets. 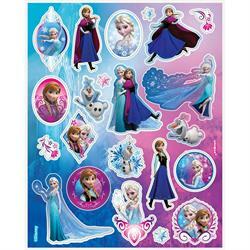 Disney Frozen Sticker Sheets feature images of Disney princesses Anna and Elsa and their lovable snowman pal Olaf. Coordinate with other Disney Frozen party supplies and decorations from Unique to bring the magic of Arendelle to your child's birthday or Frozen theme party. Each package of Disney Frozen Stickers contains 4 sticker sheets.